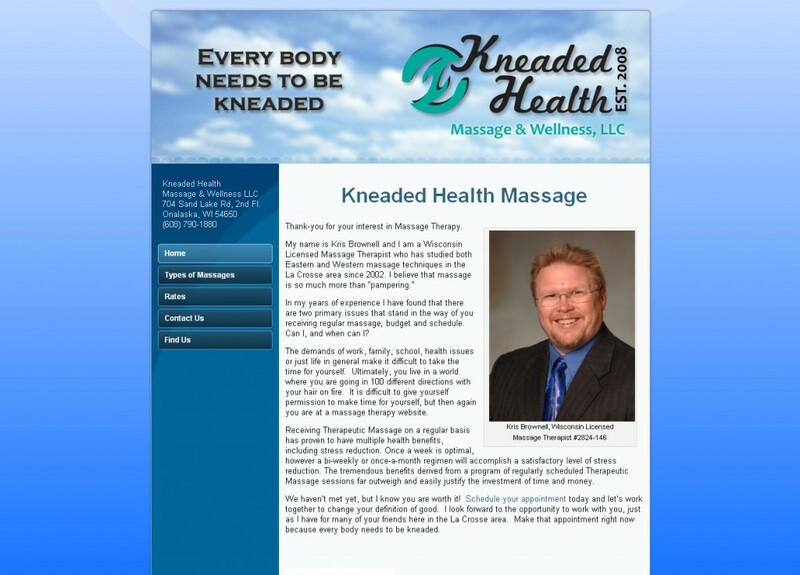 The Kneaded Health Massage website includes an embedded map, a table for pricing, and a page that describes each different type of massage. Wondering how much it would cost for a website? Contact Us and we will give you a quote on the amount. We're not happy until you are happy - Customer Satisfaction is 100% guaranteed. Small budget? No problem! We'll design your site for $300 or less. All themes are custom built - no generic themes. Check out the Portfolio page for examples of our work. If you still have questions or you would like a site built, feel free to Contact Us. © 2012 La Crosse Websites - Web Design in La Crosse, WI All rights reserved.